Michigan State University is solving the mysterious ancestry of the feral chicken population that has overrun the Hawaiian Island of Kauai. Credit: Dominic Wright. Michigan State University researcher Eben Gering has collaborated with a team in a study of the mysterious ancestry of the feral chicken population that has overrun the Hawaiian Island of Kauai. Their results, published in the current issue of Molecular Ecology, may aid efforts to curtail the damage of invasive species in the future, and help improve the biosecurity of domestic chicken breeds. Domesticated chickens, humanity's leading source of animal protein, are fighting rapidly evolving pathogens and fertility issues likely caused by inbreeding. The Red Junglefowl, the chicken's closest living relative, is believed to have been introduced to Hawaii by ancient Polynesians, and is threatened by habitat loss and the contamination of gene pools from hybridization in its native Asian range. In Kauai, a feral hybrid of the Red Junglefowl and the domesticated chicken has presented the researchers with an opportunity to study the potential practical application of invasive genetics. "It is crucial that we identify and conserve the genetic variation that still remains in the Red Junglefowl. This variation could soon be essential for the improvement or evolutionary rescue of commercial chicken breeds," said Gering, a postdoctoral research associate in the Department of Zoology. Through investigating the murky genetic origins of the chickens, the team sought to gain insights into the ongoing evolution of the population. "We are eager to learn which combinations of genes and traits are emerging from this 'evolutionary experiment,' and to see whether our findings can translate to gains in the sustainability or efficacy of egg and poultry production," Gering said. 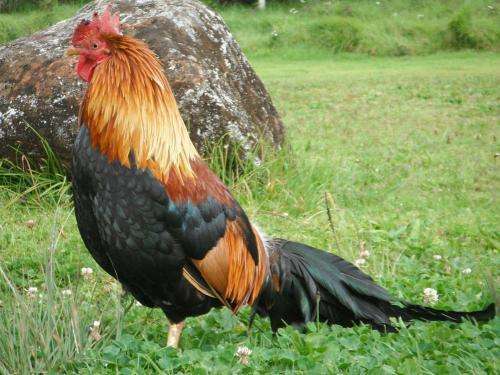 Gering and his team found that some chickens were a perfect match for genetic data from ancient Kauai cave bones that predate Captain Cook's 1778 discovery of Hawaii. Others, however, had genotypes that are found in chicken breeds developed recently in Europe and farmed worldwide. The team also found evidence for a population increase in the chickens in Kauai that coincided with storms that locals believe released chickens and caused feralization over the last few decades. Taken together, the data suggest that the population may have hybrid origins, resulting from interbreeding between the ancient Red Junglefowl and their domestic counterparts. Additional clues were found in the appearance and behavior of the chickens, which display physical traits and coloration ranging from those of ancient jungle birds to more recent domesticated breeds. Acoustic properties of rooster crows likewise ranged from those typical of the Red Junglefowl to the familiar sound heard on a domestic farm. But why do these variations matter? "Darwin drew heavily from his studies of domesticated species to develop his theory of evolution," Gering said. "This can provide important insights into evolution in action within human altered landscapes, and may even someday help build a better chicken. And that would be something to crow about."